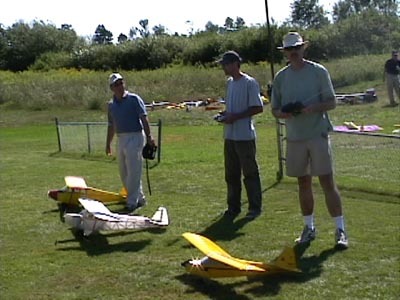 For those who thought the EMFSO Oakville Fun Fly, held on May 24th, was going to be a wash-out, look at that sun glinting off of Marc Thomson's E3D. This plane performed some very spectacular maneauvers with Marc at the controls. What a great shot from the EMFSO Oakville Electric Fun Fly. That's Michael Rogozinsky's jet liner and Rob Campbell's Logo 20 in close formation. Read all about these, and many other planes in the next EMFSO Newsletter. Marc Thomson's CL-415 Water Bomber at the recent Christie Float Fly. 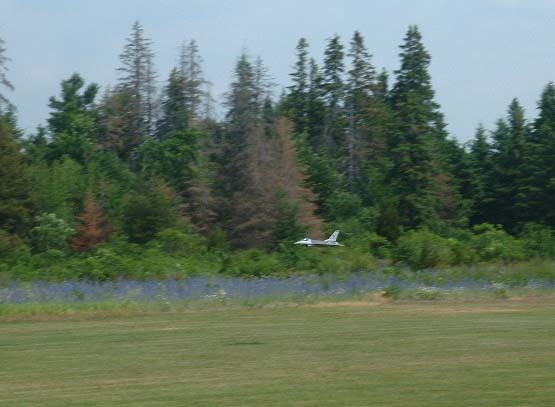 Jepe F16 ducted fan jet as it speeds through a low pass over the field at the Kingston 2003 Electric Fun Fly. 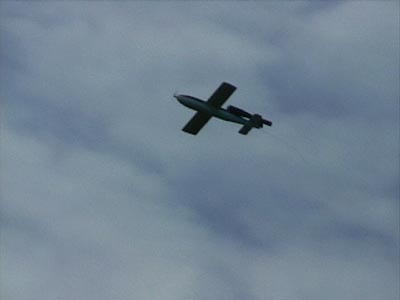 Features: Full throttle speed estimated at 100mph, and capable of virtually unlimited vertical flight. Waiting for more Cubs at Richmond Hill.